One of the things that brings my wife and I so much happiness is to garden together. Second to that is cooking from our garden. To plant the seeds, nurture them, watch them grow with excitement and then to harvest with much anticipation, it only seems right to make those ingredients shine. This recipe is one of our favorites and most times, we leave the pork out of the dish, making the vegetables center stage. In a bowl, combine tomatoes and jalapenos with olive oil, salt and black pepper. Mix well. Place on sheet tray lined with parchment paper and roast in a 425F oven until jalapenos are tender. Remove from oven and place in saucepot. Cover and bring to a simmer. Add the Knorr Ultimate Vegetable Base and basil. Stir well and puree. Keep warm. Cut the squash in half lengthwise. Using a spoon, remove the seeds. Place on a sheet tray lined with parchment paper. Place cut side up. Season inside of both halves and add 1 ½ Tbsp of clarified butter per half. Roast until tender, about 30 minutes. Remove from the oven and let sit for 10 minutes. Use a fork to remove the strands of the squash. Heat the clarified butter in a nonstick sauté pan. Add the ground pork, breaking up with a spoon. Cook until it is lightly charred. In a small bowl, mix the Knorr Ultimate Vegetable Base with the water. Add vegetable base, onions and garlic to the pork. Cover and cook until onions are tender. Toss the eggplant in a bowl with olive oil, salt and pepper. Place on a sheet plan lined with parchment paper and roast until tender. Place hot spaghetti squash in a pasta bowl. Add a few pieces of mini eggplant. 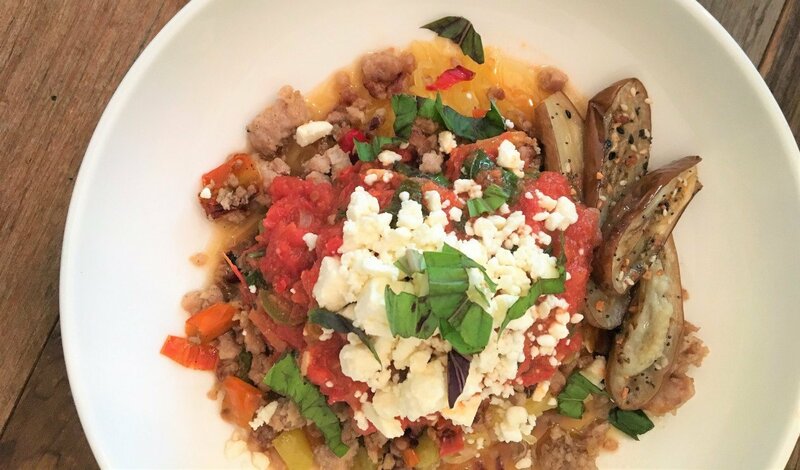 Top squash with 4 ounces of pork, jalapeno tomato sauce, feta cheese and Thai basil.